Cyndee Lee Rule is a new force in the Space Rock arena. She has played with the Philly band Scattered Planets for several years and will appear on Systems Theory’s new CD later in 2006. UFOsmosis is Cyndee’s solo release of eleven instrumental tracks ranging from funky jazz through traditional to the outer limits of our galaxy. By playing her 5-string Viper e-Violin through a Zoom 606 pedal, Cyndee can transform her instrument into a variety of sounds from guitar to a whole orchestra. 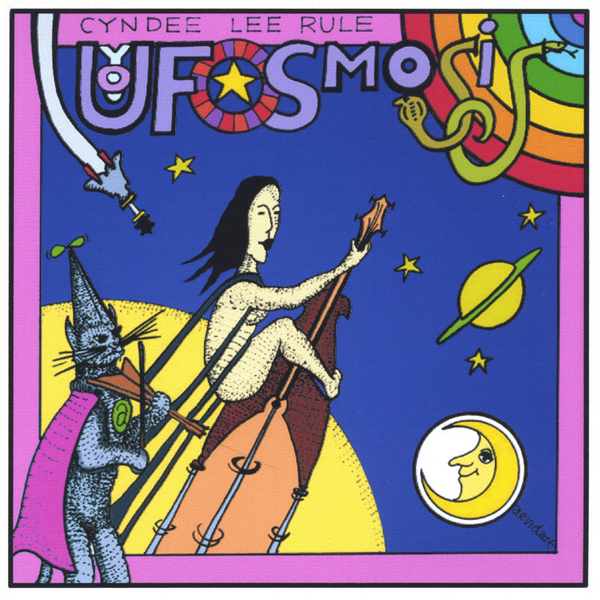 Highlights for me on UFOsmosis are the traditional “Congress Reel,” my all time favorite George Harrison song “The Inner Light,” “Scarborough Fair,” and Hawkwind’s “Assassins of Allah.” Cyndee breathes new life into these classic songs. This album is something special and you can tell that Cyndee is no stranger to Space Rock. And to top it off she has the credentials too, having played with Nik Turner and other Hawkwind alumni. The cover artwork is also a testament to her musical prowess as it was drawn by non-other than Daevid Allen. I am sure that we will hear more of Ms. Rule in the future. But for now, you can satisfy your midnight cravings for electric violin by seeking out this new CD.